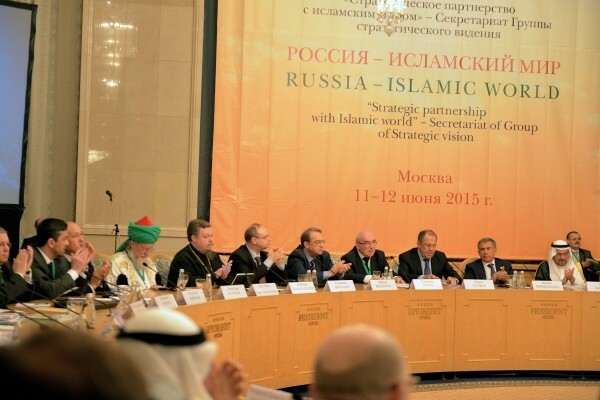 On June 11, 2015, the Strategic Vision Group ‘Russia – Islamic World’ began its meeting in Moscow under the chairmanship of R. Minnikhanov, acting head of the Republic of Tatarstan. Mr. S. Lavrov, Russian Minister of Foreign Affairs, read out a message of greeting from President V. Putin. The Russian Orthodox Church was represented by Archpriest Vsevolod Chaplin, head of the Moscow Patriarchate department for church-society relations, Archpriest Lev Semenov, director of the Religious Education Center of the St. Tikhon Orthodox University of the Humanities, and I. Kashitsyn of the DECR section for international contacts. In his remarks, Archpriest Vsevolod Chaplin pointed to common challenges facing Christians and Muslims, stating the need for a common response to these challenges based on traditional ethical principles. He also stressed the Russian Orthodox Church’s profound concern for the situation of the Christian population in the Middle East and North Africa. Among the Islamic religious leaders who attended the meeting were Talgat khazrat Tajudin, chairman of the Central Russia Muslim Board, Ahmad Badreddin Hassoun, Supreme mufti of Syria, Mufti Sheikh Ravil Gainutdin, chairman of the Russian Federation Moslem Board, Ayatollah Moshen Araki, secretary general of the World Forum for Proximity of Islamic Schools of Thought, Kamil Samigullin, Mufti of Tatarstan, Din Syamsuddin, head of the Indonesian Muhammadiyah, Naser al-Daud, member of the Saudi Majlis Consultative Council, and others. The meeting was also attended by political leaders, diplomats and scholars. It will discuss cooperation between Russia and the Moslem world and the situation in the Middle East and North Africa.